Lists have been, and continue to be, all the rage on the Internet so today I bring you 11 easy and creative ways to give back to the community. Point being, the goofy listicles are often a lot of fun but most aren’t as helpful as we’d like them to be. Even those with neverending recipes or essential oil recipes are informational at times, but with all of the ‘borrowed’ photos people use, the posts take longer to load than they do to skim. And let’s be honest, most people are skimming that list of 30+ things. So at the end of it all, I imagine most people only remember or care about a just over a handful of the things listed. I am therefore making it easy and my lists on this site will only go up to 11. No matter where you are outside, there is bound to be some plastic trash that somehow didn’t make it into the bin. Enter GRABBITS, a creative commons project that wants to engage people to tackle the problem of plastic pollution. They even give away prizes for participants sharing their pickups. What’s great about Grabbits is that you don’t need special skills or tools and also don’t need an appointment. You can do it when the mood strikes you in whatever spare time you have. Cardz For Kidz! wants to uplift spirits one homemade card at a time. They deliver homemade cards to children around the globe who are hospitalized and/or traumatized. This handmade creative project is something you can sneak into your day 10 minutes at a time. Bring your sense of humor and desire to make a child smile. Extensive art skills are completely unnecessary. But if you’re stumped and looking for a place to start, try this inspirational card with a Dollar Store Hawaiian Lei. This is a great way to foster creativity and provide a wonderful diversion for children in the hospital. The Jared Box Project even provides simple instructions on how to get started. Preemies of the Carolinas lets you exercise your sewing machine and make a teeny dent in your fabric stash. I love how something so small and simple can be so meaningful to families and babies in need. The pattern is very straightforward and it would be a great project for beginners trying to test their sewing skills. I even have a tutorial on how to sew the inspirational hearts if you need some additional instruction. Big Brother, Big Sister may not typically make a list of creative ways to give back, but this option is one for the “easy” column. I realize time during the day may be in short supply, but this is time well spent. There are kids looking for a friend or mentor or just someone to show them what the world has to offer outside of their daily lives. No Kid Hungry wants to end the child hunger problem. While one option is to combat food insecurity with canned goods, No Kid Hungry also provides additional ways to fundraise for this great cause. If you like to get creative in the kitchen, why not host a bake sale to benefit No Kid Hungry? It is the perfect opportunity to test out all those scrumptious recipes you’ve found on Pinterest, but don’t want to eat everything you make all by yourself. Ben’s Bells are hung randomly around the community for people to find and take home as a reminder to practice intentional kindness. Even if you don’t live in an area where you can help to construct a bell, they offer a variety of ways to get involved. The Crayon Initiative gets a double gold star in the creativity and giving back categories because it is an eco-friendly and creative way to give back to the community. Volunteering is as easy. You just need to designate a bin, download a sticker, and start collecting crayons. 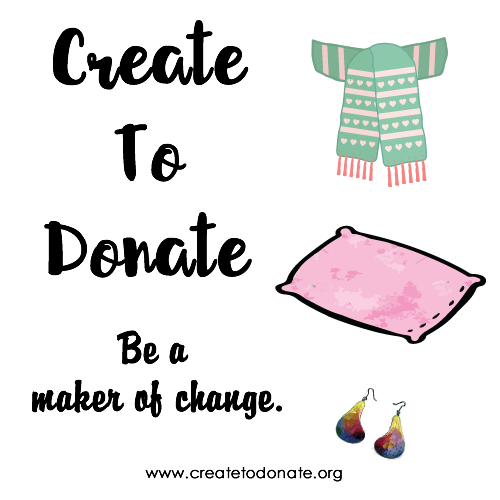 They have a whole list of how you can help which includes a variety of handmade items that range from pillowcases and quilts to handmade dolls and capes for kids. Who knew that hosting a wine sampling would be on a list of creative ways to give back? Enter Wines For Humanity. You supply the location, invite some friends, and provide some snacks and Wines For Humanity will do the rest. One of the great things about this organization is that the proceeds from the wines selected will go to a local charity in your community. It seems fitting that I would end a list on ways to give back by introducing you to an organization called Hope in a Suitcase. For years I have heard about how many foster children transport their belongings in trash bags as they are brought to a new home. And frankly, I wasn’t sure how to help. The organization has a wish list of items they need for each suitcase. Some are items you can purchase and donate, but they also welcome appropriate handmade items. I’m thinking a no-sew fleece blanket would be a wonderful project to make and donate. It would be such a comforting and personal item. These 11 easy and creative ways to give back are just a start. I will continue to showcase wonderful organizations that are making a difference in communities worldwide because it’s important to support small groups working to improve our world and our connections to each other. Enter A Mother’s Day Giveaway! I also like to give back to you, my readers, so I have partnered with some wonderful bloggers to bring you a Mother’s Day giveaway valued at $250. Take a minute to follow the directions below and enter for a chance to win! We are so excited to be giving away $250 in cash prizes for Mother’s Day to one lucky reader. The prize will consist of $250 in gift card(s). The winner will choose the gift card(s) you want. Please choose a gift card(s) which comes from an online store and can be paid by US dollars. EX: Amazon, Target, Walmart, Macy’s, Kohls, etc. You may ask for more than one gift card, but must add up to $250. The giveaway will end midnight on Friday, May 12th, a few days before Mother’s Day. You will have 48 hours to respond to the email claiming the prize. If we don’t hear in 48 hours, we will choose another winner. The giveaway is open to anyone over 18 years of age and able to receive egift cards. What am I doing for Mother’s Day? Spending time with my kid of course 🙂 Start with a fun breakfast and maybe a trip to the zoo. That sounds like fun! What animals are your favorites? I am a big fan of the elephants. this is an awesome and thoughtful list! bless your heart and your good vibes! Courtney, Thank you for the kind words. Good vibes are always the way to go! Lovely ideas! We choose how we use the Internet. Why not giving back? Beautiful initiatives! I’m spreading the word.